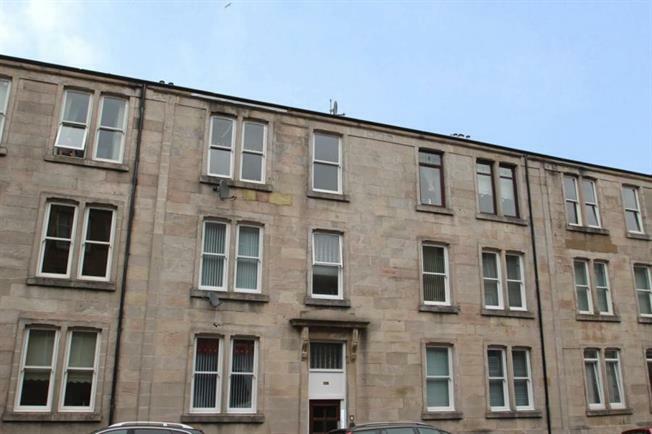 2 Bedroom Upper Floor Flat For Sale in Inverclyde for Offers Over £57,000. A superb traditional second floor flat situated within a convenient locale in close proximity to local shopping, primary and secondary schooling as well as both road and rail links for destinations further afield. This is a well presented property in excellent decorative order throughout having being recently redecorated by the current owner. The accommodation extends to a welcoming reception hallway incorporating storage with the hall leading into a spacious lounge/dining room. The modern fitted kitchen features ample storage space in the form of both base and wall mounted white high gloss units. In addition within the kitchen there is a Country Range style cooker with an extractor hood and partial aspect towards the estuary. There are two double bedrooms with bedroom number two featuring a storage cupboard. The bathroom comprises of a three piece white bathroom suite with a wall mounted over bath shower as well as tiled walls. Specification of this property includes double glazing and gas fired central heating. Entry can be gained to the well maintained communal entrance of this property via security door entry system. There are communal garden grounds located at the rear of this property. In addition this property offers further storage in the form of cellarage. Early viewing is highly recommended to fully appreciate both the accommodation on offer as well as its convenient locale.